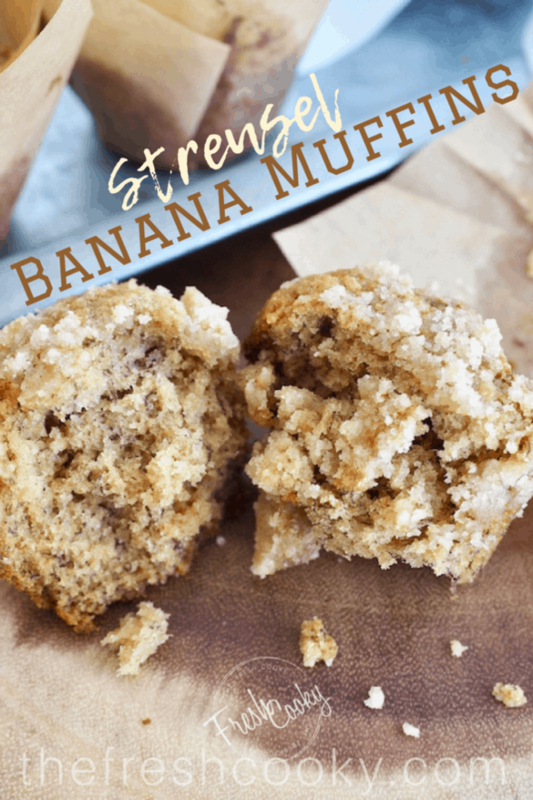 Light, tender, cake like banana muffins with incredible nutty flavor, topped with crunchy, buttery streusel! This past weekend I wanted to make a treat for my kids in honor of the start of school. We had several overripe bananas, using my Banana Graham Oat Bread recipe as the base and a few additions and presto you have these beautiful muffins! First make up the basic recipe for my Banana Graham Oat Bread, then add a tablespoon of heavy cream, buttermilk or milk. Preheat oven to 350° and line muffin tin with cupcake liners or [amazon_textlink asin=’B01KWTGAVQ’ text=’silicone liners’ template=’ProductLink’ store=’thefreshcoo0a-20′ marketplace=’US’ link_id=’706901c0-a4d1-11e8-b37e-5d51dbdc9869′], I love these [amazon_textlink asin=’B071WDGNNS’ text=’tulip liners’ template=’ProductLink’ store=’thefreshcoo0a-20′ marketplace=’US’ link_id=’7b2dcf41-a4d1-11e8-ba89-6571517fc55b’]! Using a [amazon_textlink asin=’B00004UE65′ text=’large scoop‘ template=’ProductLink’ store=’thefreshcoo0a-20′ marketplace=’US’ link_id=’455f6583-a4d1-11e8-aa7a-e7fbc4eef734′] fill prepared [amazon_textlink asin=’B001IANICS’ text=’muffin tins’ template=’ProductLink’ store=’thefreshcoo0a-20′ marketplace=’US’ link_id=’32b6a261-a4d1-11e8-a758-17eb16cda568′] about 2/3 full with batter, set aside and preheat your oven to 350°. 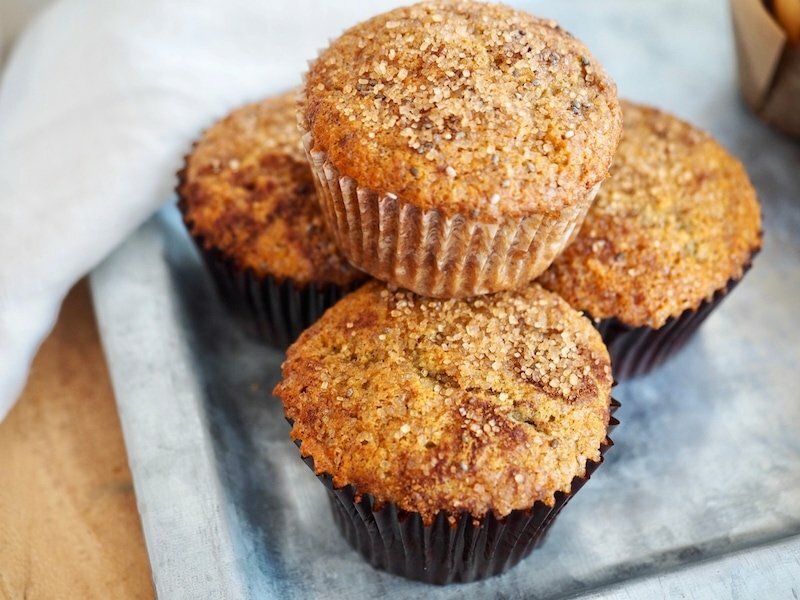 TIP | If you prefer “naked” muffins, simply bake as is, or top each muffin before baking with a little [amazon_textlink asin=’B005FO27G6′ text=’Demerara sugar ‘ template=’ProductLink’ store=’thefreshcoo0a-20′ marketplace=’US’ link_id=’f65ca6d1-a4d0-11e8-8859-0f50755e893b’]and a sprinkle of cinnamon. Next, make your streusel (drool!) topping, it really just takes a minute! 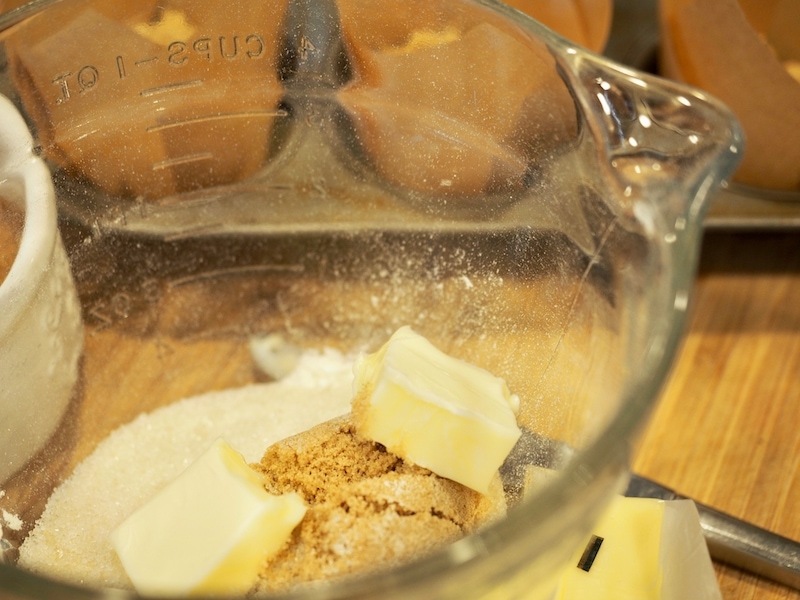 In a small bowl add 1/2 cup all-purpose flour, 1/3 cup natural cane sugar and 1/3 cup brown sugar, mix with a fork, then add 4 tablespoons softened butter. Using a fork (or even your fingers), mix until the mixture starts to hold together when pressed. Evenly sprinkle (keeping some larger chunks) over the tops of uncooked muffins. Bake at 350° for 18-20 minutes until toothpick inserted comes out clean. TIP | I actually made half streusel and half sugar topped, if you do the same, simply make half of the streusel recipe, unless you really love them loaded with streusel…which I do…but I didn’t…I don’t know why! Sigh! Makes between 18-20 muffins depending on how full you fill the cups. Cool on rack for 5 minutes before removing to cool completely. Store in sealed container, on the counter for up to 4 days, in the fridge or for freezer several weeks. Please comment below and be sure to tag @thefreshcooky on Instagram and hashtag #thefreshcooky. 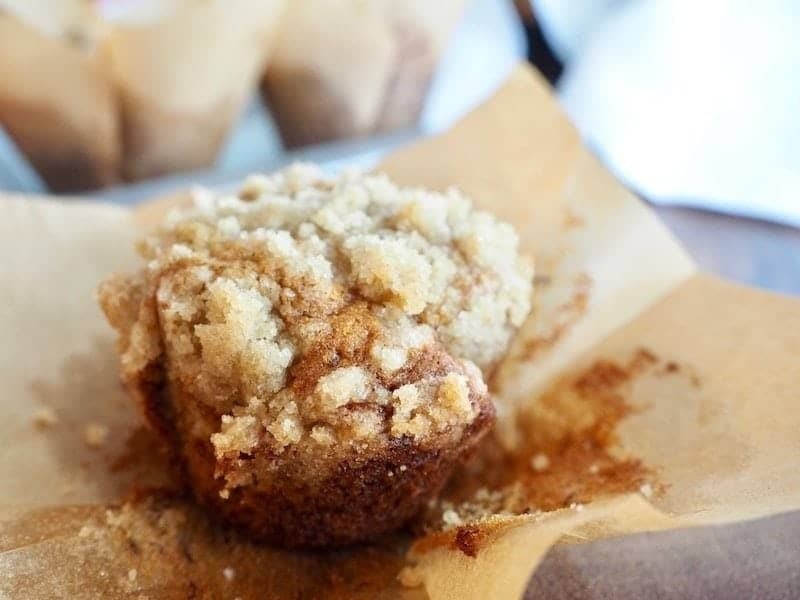 Light, tender, cake like banana muffins with incredible nutty flavor, topped with crunchy, buttery streusel. Add your natural cane sugar and your honey, cream again until sugar and honey are combined well with butter and mix for 1-2 minutes on medium. Lightly beat your eggs in a small bowl. With mixer on low add in your mashed bananas along with the eggs and mix until combined, about a minute, scrape sides of bowl to release any butter if needed. Add cream (milk or Buttermilk) mixing on low just until combined. 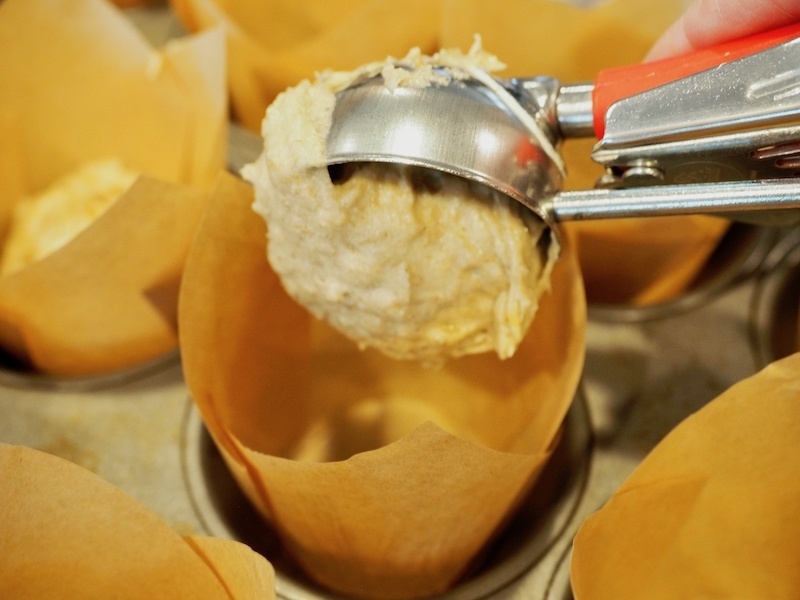 Using a large scoop, fill prepared (lined and sprayed) muffin cups about 2/3 full. If desired sprinkle with a little demerara sugar and cinnamon. Or make streusel by combining streusel ingredients combining well with fork until well combined, you might even want to use your fingers. 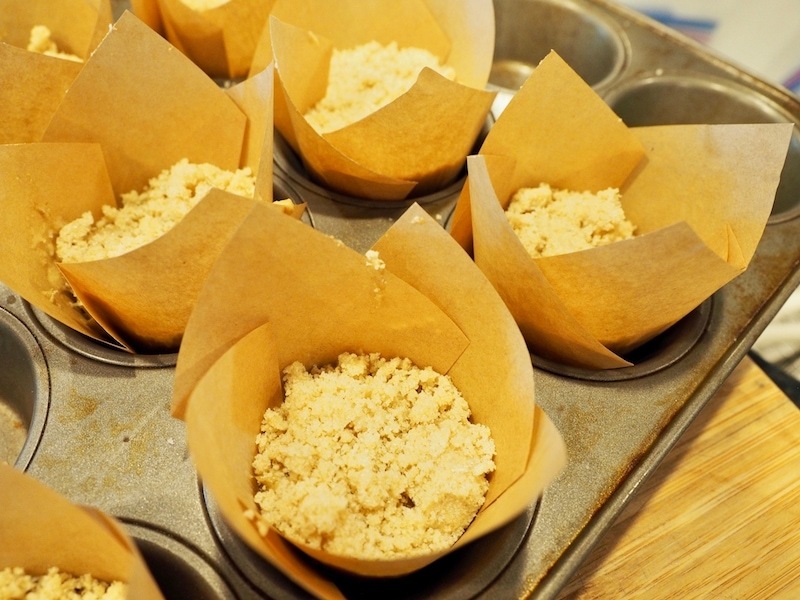 Evenly distribute the streusel topping over all of the muffins, leaving some chunks larger. Bake at 350° for 18-20 minutes until toothpick inserted in middle comes out clean. Cool in tin on wire rack for 5 minutes before removing to rack to cool completely. 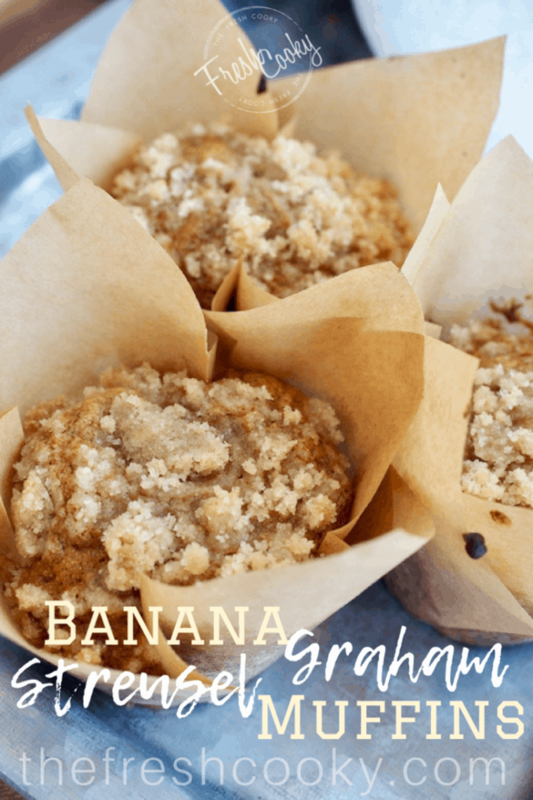 © 2018 | This recipe for Banana Graham Streusel Muffins was featured first on The Fresh Cooky.